Resorting to the Coast promotes the colourful seaside resorts of the Tendring coast in Essex. 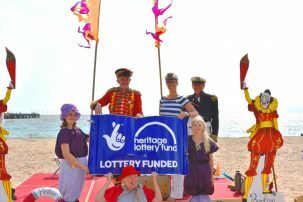 We aim to celebrate and share the seaside heritage of Tendring, bringing it together under one parasol! Tendring’s coastal resorts played a key role in the establishment of the nostalgic ‘British Seaside Holiday’ since they became popular in the late Victorian era. Here you can browse through our collection of historical material, which includes photos, old documents and the memories of local people. We are a community celebrating our seaside heritage and proud of it! Seaside holidays are timeless and today’s families can celebrate their own ‘resorting to the coast’ by making a generation of new memories. Leave no seashell unturned as you explore our seaside resorts of today and yesteryear. Start your new heritage journey here by discovering the awesome resorts of Clacton-on-Sea, Walton-on-the-Naze, Jaywick Sands, Frinton-on-Sea, Harwich and Dovercourt. Prepare to be astonished! Resorting to the Coast is a Heritage Lottery Funded and Essex County Council project, supported by Tendring District Council.